There has been some confusion and misrepresentation of the facts, which continues today, especially in some partisan quarters. The Republicans were a minority in both the West Virginia House of Delegates and the West Virginia State Senate. The Governor was a Democrat. 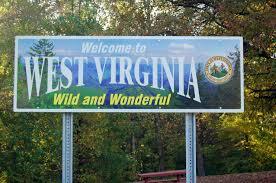 West Virginia was at the bottom ranking of economic prosperity in the nation, and, even worse, the Eastern Panhandle of West Virginia was being short-changed and neglected by the Governor and the Legislature. 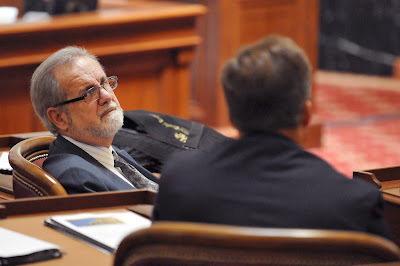 Freshman Republican Delegate Larry D. Kump saw all of this, and he decided to draw attention to this disdain toward the Eastern Panhandle. That's why he introduced HB 2698, which was done at little or no expense to taxpayers. If enacted into law (it wasn't), HB 2698 would have drawn further attention to the plight of West Virginia's Eastern Panhandle, by providing for an advisory referendum at the next regularly scheduled election for voters in the Eastern Panhandle (Berkeley, Morgan, & Jefferson counties). If enacted into law, this advisory referendum would allow Eastern Panhandle voters to express their opinion to the Legislature on whether or not to remain in West Virginia or to ask the Legislature to allow them to become part of Virginia. Although this proposal was not enacted into law, nor did it get a committee hearing, it did get the immediate attention of the media. Much discussion thereafter ensued about the ongoing circumstances of the Eastern Panhandle, albeit also with notable confusion about the actual provisions and intent of HB 2698. Since then, the Eastern Panhandle has continued to grow. The Republican Party has increased its representation in the Eastern Panhandle, and the Republican Party now is the majority party in both the West Virginia House of Delegates and the West Virginia State Senate. The Governor also now is a Republican. Further, Republicans from the Eastern Panhandle now are strongly represented among West Virginia's elected officials. West Virginia still has many challenges, but we now are moving forward and getting better, with the Eastern Panhandle providing a great degree of this leadership. Larry D. Kump's concern about the well-being of the Eastern Panhandle has been vindicated, and he now is moving forward to do more on behalf of the Eastern Panhandle and all Mountaineers. 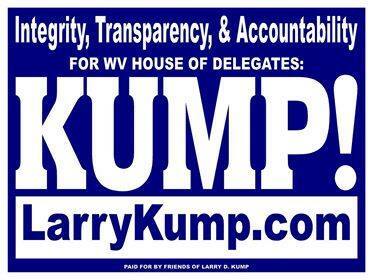 Support and vote for Larry D. Kump for the West Virginia House of Delegates District #59 (Berkeley-Morgan counties). Please share this message with others, and may God bless you all real good! Some of the social changes we’ve had to endure over the last couple of decades have made life increasingly frustrating, but we can turn things around if we want to. We do this by looking past the political rhetoric, and focus on real American values, as opposed to perverted values being sold to us by politicians vying for the vote of each well defined group they themselves created. We can restore America if we vote for the right people. People who hold to values that made this a great Country to live in. Those we send to represent us must have impeccable character and integrity as testified by people who know them best, people with know-how, and a proven record of success. Larry Kump, candidate for the West Virginia House of Delegates, Dist. 59, has demonstrated that he is sensitive to injustices, and has taken them on at every turn, but never has he used them to incite unrest for political gain. Larry is a commonsense, Christian man who will keep our individual rights front and center. A man of principle and high moral values, dedicated to doing what’s right for West Virginians. A Constitutional Conservative, with a proven record of accomplishment in the WV House, but more importantly, a man we can trust. As a long time friend of Larry’s I can tell you , he didn’t just start caring when he entered politics. His entering politics was a result of his genuine concern, and confidence in his ability to get things done. After a brief time away, his desire to reenter public service comes at the urging of those who know him best, and are confident there’s no one better for the job. I urge the people of the 59th District to support Larry Kump in the upcoming West Virginia election. You’ve never had anyone fight harder for you, and as someone who lives outside of your district, I know our State can only benefit from his strong presence in Charleston. 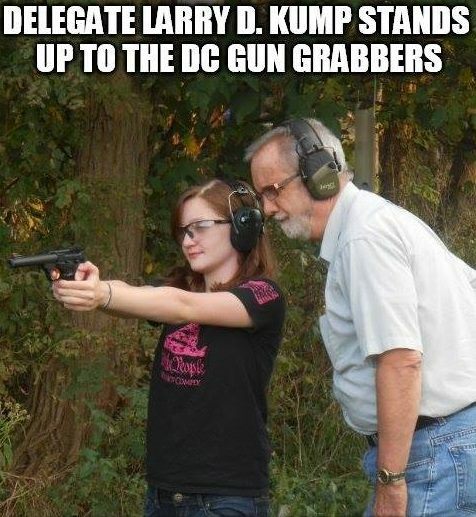 I know I share this confidence with many people across our State, putting Larry Kump back in the House of Delegates is a big step in the right direction for West Virginians. Postscript: Visit www.LarryKump.com and www.LarryKump.us for more about the issues, and please share this message with others, asking them to go and do likewise. Finally, and may God bless you all real good! The National Rifle Association (NRA) has endorsed the election of Larry D. Kump to the West Virginia House of Delegates District #59 (Morgan-Berkeley counties). This NRA election endorsement was based on Larry's previous citizen legislator voting record in the West Virginia House of Delegates (2010-2014) and his ongoing support of our 2nd Amendment rights, as outlined in our United States and West Virginia constitutions. I am honored to have the endorsement of the West Virginia Christian Conservatives. "As the Election nears, we will noting which candidates for State Office support Life at Conception. Larry D. Kump (R-59) is running for the House of Delegates in the Berkeley - Morgan County area and has long been a supporter of Pro-Life legislation. 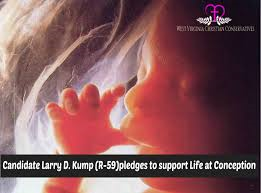 If you support the Right to Life, please support Larry D.Kump." West Virginians for Life also have endorsed the election of Larry D. Kump. 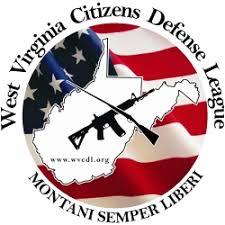 WV Citizens Defense League endorses Kump! My stalwart support of our 2nd Amendment and all other Constitutional rights and responsibilities will never waver. That's for sure and for certain. Please contact Patty "Patch" Adams, to volunteer to help of my election campaign, or even just to request a "Kump!" sign for your yard. West Virginia Car endorses Kump! 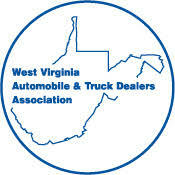 The West Virginia Automotive & Truck Dealers Association has endorsed the election of Larry D. Kump to the West Virginia House of Delegates District #59 (Berkeley-Morgan counties). They applaud Larry D. Kump's past and future efforts toward improving West Virginia's economic and jobs climate. 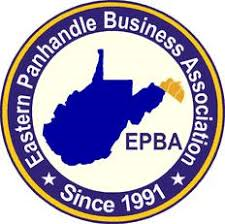 Eastern Panhandle Business Association endorses Kump! The Blue Ridge Patriots is a non-profit group of patriotic citizens. Please place a "Kump!" election sign in your yard. 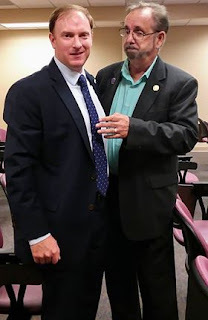 Blue Ridge Patriots endorse Kump! West Virginia State Auditor John McCuskey and Larry D. Kump, at the Berkeley County Council meeting. 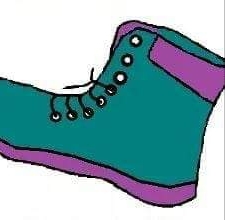 For more about good governance issues, visit www.LarryKump.com.